I've recently started building stuff with NodeRED, which I really enjoy. Since I'm using MQTT as the central message bus for my system, I find myself regularly in need of knowing the current state of my MQTT topics. There are a couple of tools around, for instance MQTT.fx, which are specifically built for this purpose; but I found that MQTT.fx likes to cause high CPU load when the topic scanner thingy is running. So I'm looking for an alternative, and I thought, why not build it in NodeRED? So that's what I did. The topmost line stores all incoming data into the Flow context. The middle line serves HTTP requests and responds with a table of current data. The bottom line catches errors and responds with an Error page for debugging. This adds a data variable to the Flow context and stores, for each topic, the last message received and the time that message arrived. That's it. This part proves to be a bit trickier. It first of all requires an HTTP input node bound to a URL (I used /mqtt), so that we have a URL to point our browser to. 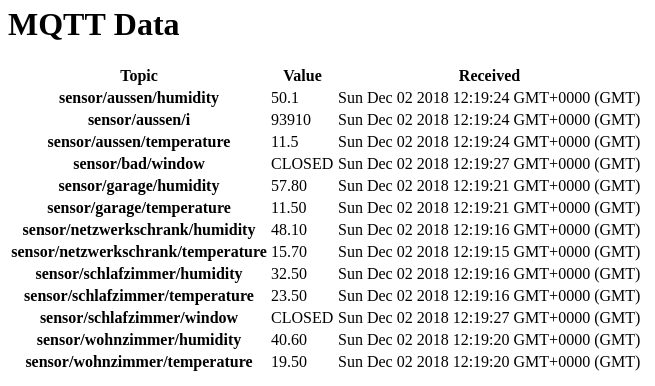 Then we need a function node to retrieve our data from the Flow context and turn it into a list to be processed by the template node, and a template node to render it into a (somewhat) nice table view for the humans to consume. Lastly, we pipe the result into an HTTP response node with its status code set to 200. The page will display more and more data over time, depending on how frequently your MQTT devices are sending data. The meta tag included in the template instructs your browser to reload the page automatically every 5 seconds.